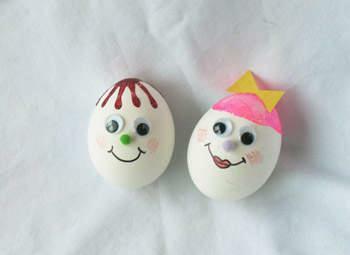 Bring out your creativity with these adorable Easter Egg Heads.They are easy to make – just think about the possibilities! And kids think the wiggle eyes are especially funny! Check out your local craft store or a dollar store to get the wiggly eyes and keep your eyes opened for things you can use for hair, hats, etc – get creative and you will love the results! You will need to decorate only one side of the egg at a time. Let the eggs dry either on egg cartons turned upside down, on a cooling rack or film canister lid. Decorate other side when first side is dry. Place egg into an empty egg carton for stability. Use glitter glue or 3-D paint to “draw” on hair. This will need to dry for several hours. If you wish to add a bow, place a small construction paper or ribbon bow into the 3-D paint or glitter glue hair before it dries all the way. Decide where you want to place the wiggle eyes and glue them in place. Draw on a mouth with a marker. Place on a decorative plate, an Easter basket, or make an arrangement for your table.